3 october 2010 - Bergen, Nesttun. 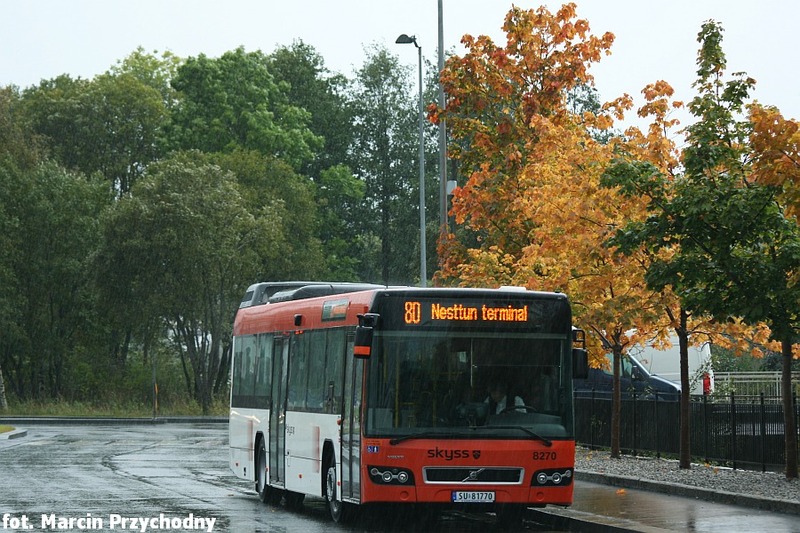 After the new trams came to Bergen, they found out that the colour scheme was so nice that they decided that all future bus contracts would use the same colours. The first contract was this one with all the 7700s, and they were actually repainted after arriving from Poland, because they were already half done. I understand, that they don't belong to Tide, but directly to the municipality? You have some very nice pics of "Bybanen" in that gallery. Oh, and one more thing - all the Volvo 7700 & 7700A buses for Hordaland were made in 2010? Yes, all the buses in the new colours are from 2010. The first ones were registered in January, so they may technically have been made in 2009, but I'm not sure.